COLUMBIA, Mo 4/29/15 (Beat Byte) -- "There’s an old tune I’m reminded of, one I’m sure Forrest Rose would remember: The Song Has Ended But the Melody Lingers On," Columbia Daily Tribune columnist Irene Haskins wrote about her friend and editor. "Too soon Forrest’s song has ended...but if those who loved him listen real carefully, they’ll hear the strains of his life’s melody, lingering on." 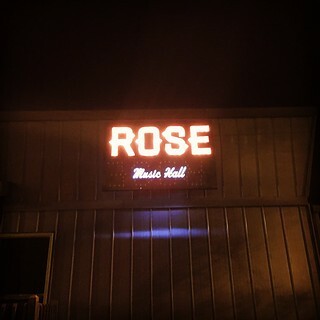 Rose's life melody lingers on in a music hall named in his honor, next to the park also so named. Mojo's officially became The Rose Music Hall April 23, with a sign unveiling and celebration -- of a Columbia music scene supporter whose well-chosen words championed liberty and justice for the voiceless and powerless. "We love this venue and this park," said Rose Music Hall co-owner Matt Gerding. "We think Forrest would be proud." Well before Columbia Daily Tribune publisher Hank Waters started calling out locals for practicing democratic dissent, he employed Rose -- who died at age 48 in 2005 -- to write a popular series of editorials in the finest dissident tradition. Why was the Boone County Commission getting into the "parks business?" he asked 22 years ago, in one of his earliest online columns. Didn't county government have far more pressing demands on taxpayer money? A pot bust later ruled illegal illustrated a "lack of common sense" among Boone County Sheriff deputies, Rose opined. The NRA. The Columbia Police Officers Association. The MSU name change. The fog of war. No issue escaped his watchdog gaze. Ever the contrarian, Rose's last column blasted the "Puritanical" over-reach of Columbia's popular smoking ban. "I don’t doubt for a moment that secondhand smoke is bad for you, just as SUV exhaust, red meat, rye whiskey and elevator music are bad for you," he wrote. "But I do believe anti-smoking zealots do not hesitate to overstate the real risks." It was Forrest at his provocative best. "Sticking up for unpopular causes and people has always been something of a specialty of mine," Rose said. "Holocaust deniers, gay bridegrooms, death row inmates, progressive taxers, drug law reformers, race-baiters and abortionists: These I have defended with all the arguments at my disposal." After his death, Rose's critics defended him. "Forrest Rose never penned a column with which I was in agreement," wrote retired Marine Corps Colonel J. Karl Miller, who penned dozens of his own columns for the Columbia Missourian. "Nevertheless...I grew to respect him as a man of principle and conviction. Although we were at odds both politically and philosophically, he was a worthy adversary." "When my longtime marriage came to an abrupt end, Forrest was my rock...always there for me," Haskins remembered. "Accomplished musician, thought-provoking columnist, a special son, only brother to five sisters, doting dad, and for so many, including me, best friend. "I’ve always thought he had a streak of Peter Pan in him. He was like a little boy who didn’t know what he wanted to do when he grew up. So he did it all."